At least eight mammals not yet cataloged by science were discovered during the Environmental Impact Assessment (EIA) for Brazil’s Sao Luiz do Tapajós hydropower plant, proposed for the western part of the state of Pará. Ironically, even as these Amazonian species are introduced to the world, they may already be headed to the endangered species list if the dam’s construction moves forward. The same national and international business consortium that is seeking the concession for the dam, also paid biologists to study the region. If those companies — led by Brazil’s Eletrobras, the world’s tenth largest electrical utility — win the dam bid, they will completely transform, and likely destroy, these animals’ habitat. 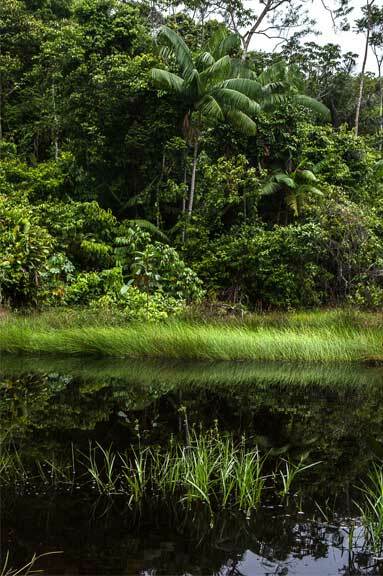 Conservationists view the EIA as especially troubling considering that some of the newly discovered species are endemic — only found in the Tapajós basin. Another irony arose on 27 April of this year concerning the dam and its EIA: the 15,000 page impact assessment could become completely irrelevant, depending on unfolding events in Brazil’s Congress, where Senator and prominent conservative businessman Blairo Maggi moved forward a constitutional amendment (PEC 65) that would end the need for environmental assessment approvals for all public works projects in Brazil, except under extreme circumstances. This fast track infrastructure amendment actually stands a fair chance of passage due to the country’s current political chaos. After president Dilma Roussef was suspended by the senate in May, Vice President Michel Temer took office and named Blairo Maggi (formerly known as the “soy king), as minister of agriculture. It should be noted that the Sao Luiz do Tapajós dam, if built, would be a key component of the Tapajós Complex, a major agribusiness canal system stretching from Brazil’s soy-rich interior to the coast. Four days after the senate voted for an impeachment trial, Temer’s interim finance minister made public statements concerning the need to increase Brazil’s energy capacity. The Sao Luiz do Tapajós dam is shaping up to have the most contentious approval process in the Amazon since the controversial Belo Monte dam. The new mega-dam located on the Tapajós River would have a maximum generating capacity of 8,040 megawatts, at an approximate total cost of R$ 23 billion (US$ 5.8 billion). The discovery of the new mammal species was confirmed by IBAMA (the Brazilian Institute of the Environment and Renewable Natural Resources), the federal licensing authority responsible for environmental permits. Among the new mammals are a species of monkey similar to the brown wooly monkey (of the Pithecia genus), a marsupial similar to the brown four-eyed opossum (of the Metachirus genus) and new species of rodents and bats. The power plant will also threaten endangered birds including the golden parakeet (Aratinga guarouba), Spix’s macaw (Anodorhynchus hyacinthius), plus several other species proven to only exist in the Tapajós basin. What the impact of these important biological discoveries will be on the dam’s future is currently a question mark, since the project is being developed amidst one of the most volatile and unpredictable political situations Brazil has seen since the 1992 presidential impeachment or the military seizure of power in 1964. The current crisis exploded with the Lava Jato corruption scandal, which largely implicated President Dilma Rousseff’s Workers’ Party government, Brazil’s biggest oil company and some of the nation’s largest construction firms active in building Amazon dams. The economic and political crisis has now deepened to include the the impeachment trial of Rousseff, and a growing forecast of recession. Back in August 2014, IBAMA found the first version of the Sao Luiz do Tapajós project’s EIA to be inadequate on a variety of technical issues. IBAMA requested that the corporate consortium redo the studies, but the Rousseff administration’s Minister of Mining and Energy, Eduardo Braga, insisted that the environmental license should be issued within the first six months of 2016, and the public auction of the concession itself be held in the following quarter. The Rousseff administration’s seeming rush to move the project forward suddenly reversed itself on April 19, 2016. That’s when the project’s license was suspended by IBAMA. The move came in response not to the EIA, but to a report published by FUNAI, Brazil’s National Indian Foundation, which — after two years of inaction —had suddenly recommended the demarcation of a 1,780 square kilometer (687 square mile) indigenous Munduruku territory, known as Sawré Muybu, that would be flooded by the dam. The reason for the FUNAI / IBAMA change of heart took most observers by surprise, since the São Luiz do Tapajós hydroelectric plant has long been a top development priority for Rousseff. A reliable but confidential source on native affairs explained the move to Repórter Brasil this way: with Rousseff expecting impeachment, the recognition of the Munduruku territory claim has the main goal of transferring the political embarrassment for backing construction of the Tapajós dam, and responsibility for the irreparable harm it will do to the Munduruku people, to Vice President Michel Temer’s interim government which took power at the start of the impeachment proceedings. The measure could also seek to appease Brazil’s social movements, which resent the past indifference of Rousseff’s government toward indigenous causes. The fact is — despite the Rousseff administration’s licensing suspension — that the hydro project is very far from dead. It is likely that the new Temer government will change up the top officials at FUNAI and IBAMA. Also, the demarcation of new indigenous territory ultimately depends on the approval of the President of the Republic. No matter how the political situation resolves, it seems likely that the Tapajós project’s Environmental Impact Assessment will play an important role. It is a monumental document, running to more than fifteen thousand pages. The EIA, as noted above, was carried out by a consortium of companies that remains very interested in obtaining the concession for the hydroelectric plant from the government. That group is led by state-owned Eletrobras and includes national companies Eletronorte, Copel, Endesa Brasil, Camargo Correa, Cemig, and Neoenergia, in addition to French-owned EDF and GDF Suez. While these companies hope to win the project contract, that result is not assured. China Three Gorges, a Chinese state-owned company, is also currently preparing to make a bid on the dam. If built, the reservoir for the São Luiz do Tapajós hydropower plant will be the fourth largest in the country, occupying an area of close to 72,225 hectares (278 square miles). It will flood native lands, fishing villages, and inundate existing islands, beaches and rainforest. The location is thought of by biologists as a cradle for some of the richest fauna in the Amazon and on Earth — it is the home of more than 95 species of mammals, 71 types of snakes, 302 butterfly types, and more than 600 species of birds. “This region has the greatest wealth of mammals ever detected in the Amazon. The environmental impact study showed various kinds of new species, still in the [scientific] description phase, that will be directly affected by the undertaking,” confirms biologist Enrico Bernard, from the Federal University of Pernambuco. Bernard, who heads up the Applied Science and Conservation of Biodiversity Laboratory in the university’s Zoology Department, made an independent analysis of the EIA and its summary — a document produced from the study’s findings for the public-at-large, and known as the Environmental Impact Memorandum (EIM). His analysis is also integrated into a report commissioned by the environmental NGO Greenpeace. Bernard found flaws in the EIA, but his most serious criticism relates to the EIM document released to the public. For him, the report on mammals is “superficial”, and hides impacts that are clearly pointed out in the complete study. In contrast to other regions that will be flooded by the dam, the animals that live in the igapó cannot be removed to other similar habitats. “In this case, you end up with the complete loss of a region where there were lots of animals, lots of tapirs, and even a new species of monkey. There will be no place for the animals to find shelter; there are no other igapós nearby. Not just this species will be at risk, but others as well,” he said. The researchers responsible for the EIA identified diverse new species, some only just now being categorized scientifically. They wrote about the discovery of five new types of bats, as well as marsupials and rodents. This information was not in the EIM report released to the public-at-large, which was distributed to the riverside communities and local Tapajós inhabitants. Bernard presented his critical analysis at a recent conference held between Greenpeace researchers and IBAMA, but the permitting agency has yet to address the environmental flaws pointed out by Bernard and other specialists. Before suspending the whole process, the permitting agency had sent both the EIA and EIM back to Eletrobras with questions that were never answered. It is unknown as yet how the Temer interim government will address the issue. Bernard argues that the consortium’s environmental study concludes that there will be impacts that will be difficult, if not impossible, to mitigate. “We are hoping that IBAMA reaches the conclusion that will be the closest to reality. The new species, this enormous biomass, and this great quantity of animals, inhabit the area to be impacted and are clearly threatened,” by the dam and its reservoir. Biologist Luciano Nicolas Naka, also with the Federal University of Pernambuco, made a critical analysis of the EIA’s findings on bird species at the request of Greenpeace. In his view, the study — though it is lengthy and can claim the participation of many researchers — does not take into account the true impacts. 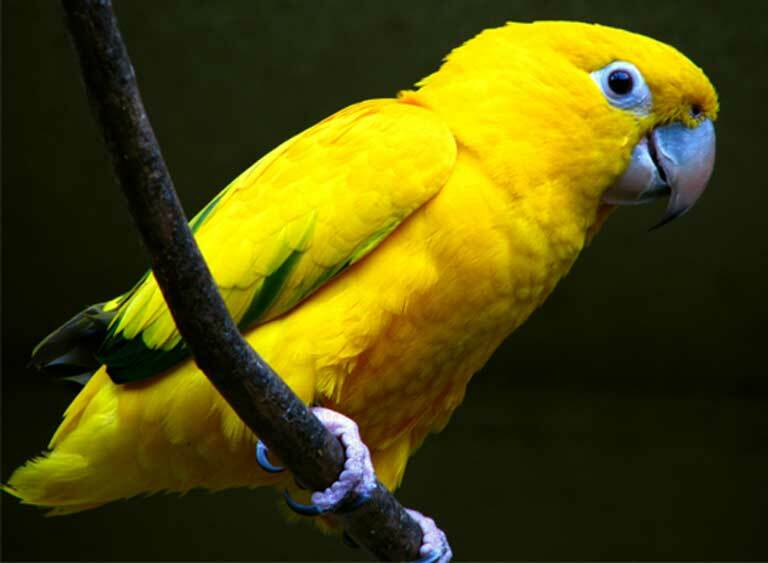 In the document, for example, the official text points to three species threatened with extinction: Spix’s macaw, a species of hummingbird, and the golden parakeet, found only in Brazil. “The information presented was not sufficient enough for the environmental bodies to evaluate the environmental and social consequences of installing a hydropower plant like the Sao Luiz do Tapajós, and permanently altering the face of one of the best-conserved rivers in the Amazon,” said the biologist. The biologist cites the example of the Blackish-gray Antshrike (Thamnophilus huberi), which in the environmental study is shown as a species limited to the igapó backwater forest and the riverine islets, specifically where the Teles Pires and Juruena rivers meet. “Those specific [habitats] will be completely lost if the [dams’] retaining barriers… get built,” stated Naka. 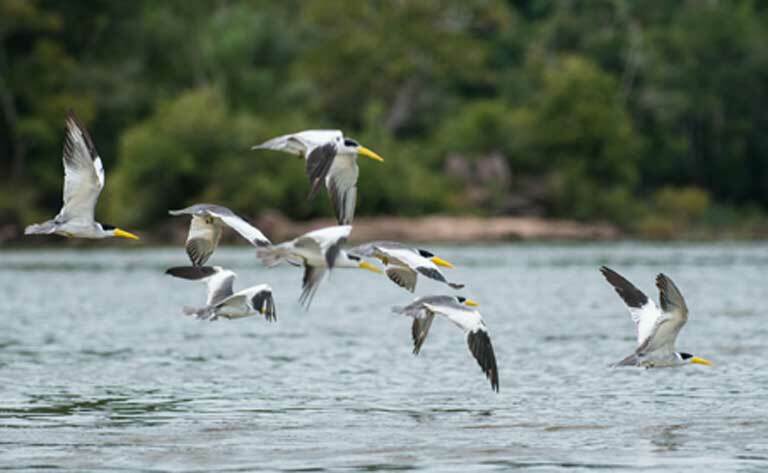 The biologist makes clear that the species most at risk are those inhabiting the riverine forests, river islands, and a narrow tract of vegetation on the Tapajós riverbanks. “These forests, known as floodplains and igapós, have an enormous amount of biodiversity which does not occur anywhere else in the world,” he said. “They depend on temporary flooding of the forest which occurs naturally in the wet and dry cycles of the Amazonian rivers. This natural flow of floodwater, which defines how the vegetation will be shaped and which types of birds can thrive there, is always affected by dams. And given that we aren’t talking about a simple dam, but a series of hydropower plants, these forests and all of their [biological] wealth might literally go under water.” The Sao Luiz do Tapajós hydropower plant is only the first of several proposed for the river and its tributaries. Naka offers a warning that has been repeated by other conservation biologists and scientists throughout Brazil: it is vital that the many dam projects planned for the whole river basin be evaluated together, and not taken one-by-one, as is being done with the São Luiz do Tapajós project. “The government’s plans are not limited to the construction of one single hydropower plant,” he stated. “There are a number of large plants planned for the region [seven, according to the most recent government proposal], with dramatic consequences on the Amazonian biodiversity and for the local human populations”. IBAMA, the licensing agency, stated that it will hold public hearings in the Tapajós region in order to discuss the viability of issuing permits, and to analyze the documents produced by independent studies, such as the report written by Greenpeace-commissioned biologists. The riverine inhabitants of the Tapajós often quote a native saying: “The river is our freezer, the forest is our supermarket.” That folk wisdom comes as a warning to those who would destroy that resource. Traditional communities hunt as a means of subsistence and survival — without the wildlife and the river’s fish they must either change their way of life or starve to death. For an urban outsider coming into the rainforest for the first time, the riverine community’s symbiotic relationship with animals isn’t easily understood. But for anyone accompanying the caboclo (a name for mixed heritage Amazonian forest-dwellers) — a walk in the nighttime forest, a swim in the backwater swamps, to “talk it up” with the monkeys — is a revelation. It becomes apparent very quickly that hunting isn’t just supermarket shopping — it is both an ancestral ritual and an act of communion with the forest. The hunters only hunt what they eat. They do not hold onto the hides, they don’t keep skulls as trophies, or mount their kills on the walls of their houses. 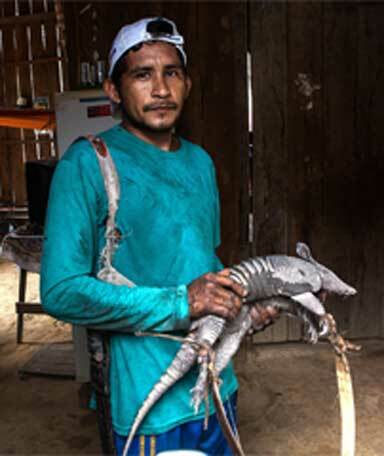 “We hunt with respect,” the hunter said, after spending a few hours in the forest with his dogs, and arriving back home with an armadillo on his back. The armadillo will feed him, his wife, father, stepmother and two brothers. A local hunter who learned about human limits in the forest from his father solemnly emphasized: “No one here hunts the jaguar. The ones who do are the cattle-ranchers, because the [jaguars] kill off the cattle”. 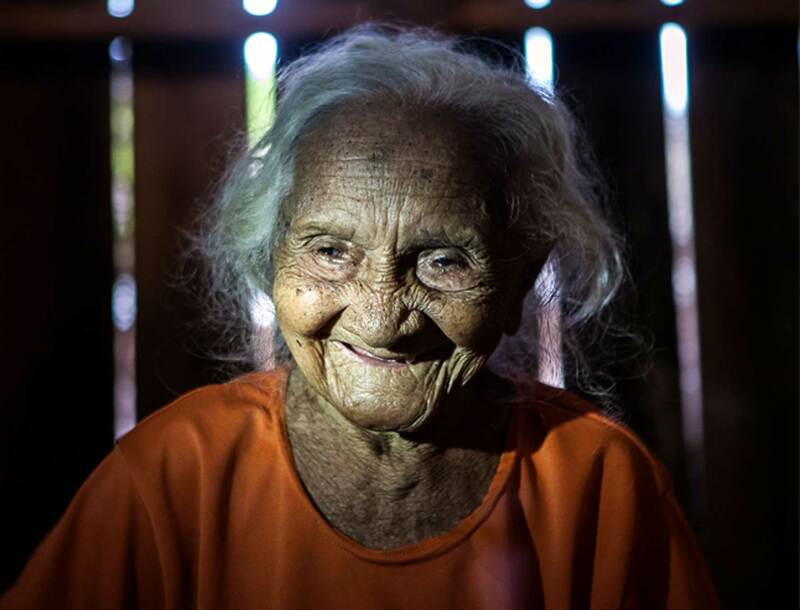 The exception to this rule is the centenarian Gabriela: “I hunted three jaguars with my rifle and bow and arrow. But only the gentler ones, because the wilder ones would turn me into their prey,” she said, smiling. Gabriela is the 107-year-old’s nickname. She was born as Maria Bibiana da Silva in Pimental, a village that will be lost to the Sao Luiz do Tapajós dam. Her longevity is living proof that the power plant will flood a community that is rich in natural human health. She cannot discuss the dam without becoming very upset. Instead she talks of the past, about how she grew up and lived in a vibrant forest — richer in animals and history even than the forest that surrounds her today.